Say hi to the Buckmans. Nichole, Will, Abbi, Willie, Hannah the dog, and Gracie May the squirrel who knows how to use a doggy door and has her own little nook in the house (yup, she lives in the house). The Buckmans own and operate Corkscrew BBQ, one of the best BBQ places in the Houston area… if not in Texas. My shoot with them has been a long time coming mainly due to scheduling. Theirs. Because if you’ve ever been to the Corkscrew you’ve seen the line out the door and both Will and Nichole are in the kitchen cutting and serving food. No vacations, no time off, just badass BBQ. And when the restaurant is closed they either spend time with family or take care of the behind-the-scenes stuff for the restaurant. It’s a small window to work with, especially when you have two young kids. So it took me putting Nichole on the spot on one of my visits to the restaurant to give me a date for us to finally do a shoot, and I’m glad she did. Because of their dog Hannah. If you’re looking through the pictures before you read this you’ll see a few things. French toast, crawfish, longboards, a very frail dog, and Gracie May with a squirrel. Oh, and did you notice the license plate on Will’s truck? Yeah, it says “BRISK3T”. We can all agree that’s the Best. License Plate. Ever. And very fitting. When Nichole and I talked details of the shoot the plan was “hanging out and doing nothing”. 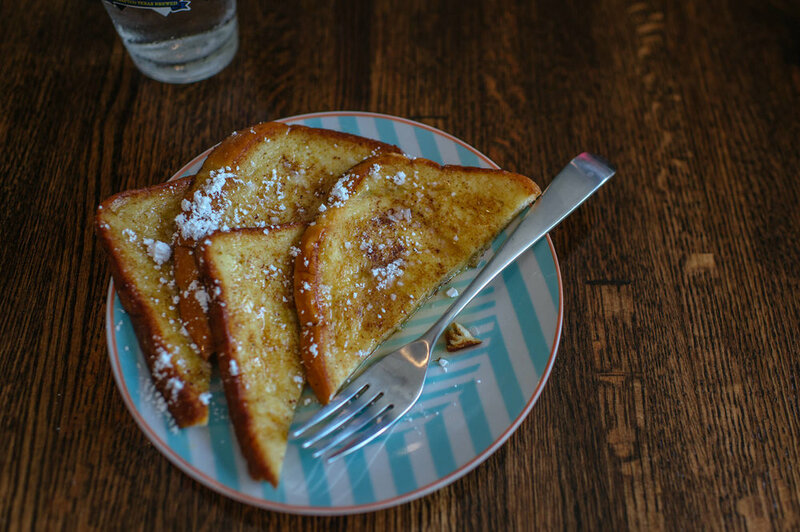 But when I got to their house and started to get my bearings Nichole, in a very proud voice, told me Abbi was going to make us french toast she had learned how to make from watching a youtube video. And guess what? The french toast was awesome. I enjoyed every bit of it. And during the french toast makinging Will had run out to get some crawfish and sides for the rest of our time together. After I finished my french toast I started walking around the amazing kitchen and into the living room. I noticed Hannah the dog laying on a blanket facing the big sunny windows of the living room. From afar she looked like she was basking in the sunlight on the couch, but as I walked closer to see if she was friendly I noticed her frail state and asked about her story. Turns out Hannah has been battling doggy cancer off and on for 7 of her 14 years and a few days before our shoot her body had finally given up. No walking, sitting, or being able to eat. What used to be a 25 pound ball of energy was laying on the couch at a very frail 10 pounds with no ability to do anything other than moving her eyes and using her tongue. Once Nichole told me about the trip to the vet for Hannah the day after our shoot I was glad our scheduling conflicts finally worked out got the chance to have Hannah be a part of our day. As we got our hands dirty with the crawfish Will, Nichole, and I talked about our favorite places to eat around town… although it was mainly about the best crawfish. 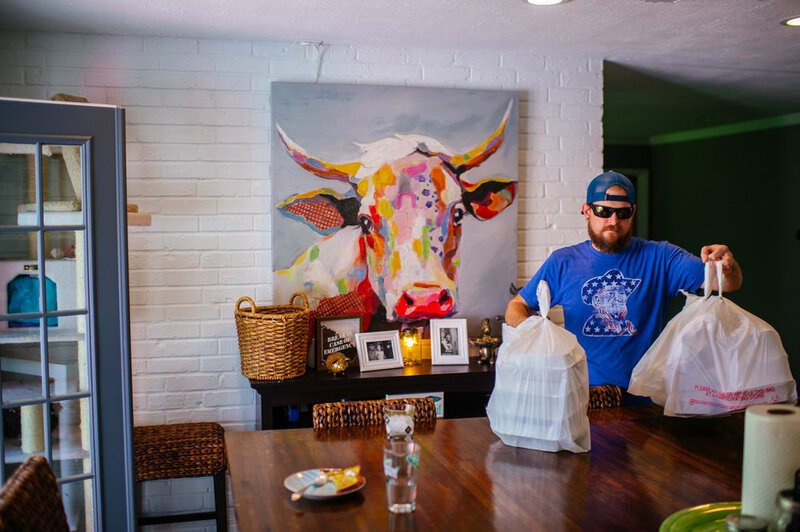 We also talked about Will’s friendship with Austin Simmons, the dinners they’ve done together, and the growing pains of the restaurant from a trailer on a dirt lot into a full brick and mortar in the perfect spot in old town Spring. Hearing first hand about the details of what led up to the decision and how it happened makes me respect that brisket even more. Sometimes just reading about restaurants opening doesn’t give you an idea of the detail that goes on behind the scenes until you hear about it first hand. The rest of our time together was spent out in the front yard. Will and the kids rode the longboards up and down the street, threw the football around with his and the neighbors kids, and Nichole sat on the grass with Hannah and talked to her next door neighbor and friend Rachel… who, by the way, I’ve known for a few years since she’s a fellow photographer. Watching the kids run around the street with no care reminded me of my house with our neighbors. Then I got introduced to Gracie May, the pet squirrel. Gracie May is a orphaned squirrel from the Buckmans backyard. They’ve been caring for it for almost two years and through whatever magic Gracie knows how to use the doggy door in the kitchen and has setup camp in the cat post sitting in the corner of the room. I never knew my bucket list included meeting someone with a pet squirrel, but now I’ve scratched that off my list. Watching Nichole play with Gracie in the backyard and Will feed him on the porch as she crawls and climbs all over both of them made me want to be part of the action, but Gracie wasn’t having it. Seeing a wild animal as skittish as a squirrel interact with humans is pretty amazing. Kinda makes you want to have your own pet squirrel. In over 3 years of doing my shoots I’ve yet to shoot a family with a pet squirrel. But much like every other chefs, the Buckmans were welcoming and enjoyable to be around. Seeing food industry folks work so many hours, dedicate themselves to their work, and raise a family all at the same time is something to marvel. After every shoot I become a little bigger fan of these industry folks and enjoy going to their restaurants more. Knowing the stories behind the food is what makes these people special. And next time I’m over at Corkscrew I’ll be thinking of the great day I spent with the Buckmans, Hannah, and Gracie. And for that reason I’ll enjoy their BBQ a little more than I already have in the past.